If you enjoy chewing gum and you follow the gluten-free diet, you need to chew gluten-free gum. Yes, it's true that you don't actually swallow the gum (usually, anyway), but you certainly swallow enough of the juices and flavoring from it to give yourself a reaction, if it's not gluten-free. Fortunately, there are numerous choices in gluten-free gum for people with celiac disease and non-celiac gluten sensitivity. The products on this list are considered gluten-free to less than 20 parts per million, or ppm (smaller numbers being better). The list applies only to the U.S. (products and formulations vary in other countries). Also, just because it's considered "gluten-free" to 20ppm, that doesn't mean it's definitely safe for you. People can and do have different tolerance levels for trace gluten (gluten below 20ppm), and many react to products labeled "gluten-free." You shouldn't need to worry about the white powder you'll usually find on your gum, assuming that the manufacturer states that the gum in question is gluten-free. Most manufacturers use powdered sugar or sugar substitute to keep their gum from sticking to the wrapper. Here's the list of gluten-free gum products, followed by those that are not gluten-free. They're grouped in alphabetical order by manufacturer. 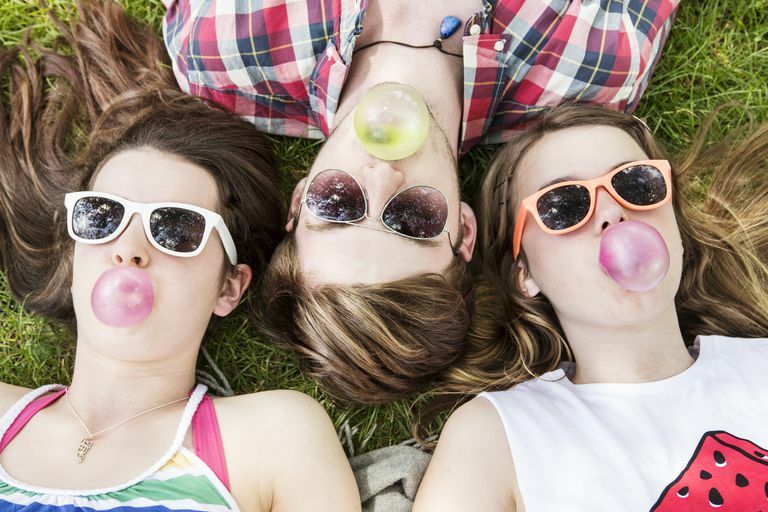 Billed as "all natural chewing gum made with sustainably harvested rainforest chicle" and "the #1 healthy alternative to synthetic chewing gum and bubble gum," Glee comes in Classic and Sugar-Free (sweetened with sugar alcohol xylitol) flavors. The gums do not contain gluten, and are "safe for people with celiac disease and any other wheat and gluten intolerances," according to Glee Gum's frequently asked questions. All flavors also are soy-free, although the manufacturer reports that soy is used in the same facility. This brand of gum uses all-natural ingredients to make its chewing gum (Simply Gum also makes mints). Simply Gum uses natural chicle, which is sap from the sapodilla, or gum, tree, to make its gum chewy. Other ingredients include: organic raw cane sugar, organic vegetable glycerin, organic rice flour, and natural flavor. The gum comes in cinnamon, fennel, mint, ginger, coffee, and maple flavors, and is considered to be gluten-free, non-GMO, vegan, and kosher. Note that there are several Wrigley products that are NOT gluten-free. These are Altoids and Smalls Peppermint Mints (they contain wheat-based maltodextrin), and Lucas and Skwinkles Branded Candy Strips (contain wheat flour and wheat fiber). In both cases, the wheat-based ingredients are called out in the ingredients lists on the product label. This company makes Fruit Stripe and Super Bubble gum. Farley's and Smathers does not maintain a gluten-free list and only will disclose wheat-containing ingredients on its labels (U.S. labeling laws do not require disclosure of all gluten ingredients, only wheat). Therefore, Farley's and Smathers products are not recommended for those following a gluten-free diet. Hershey's, a top candy bar manufacturer, also produces Bubble Yum gum and Icebreakers. However, neither of those appear on Hershey's gluten-free list, so I'd steer clear. Mondelēz International does not test for gluten, according to a customer service representative. The company will identify any wheat, barley, rye or oat ingredients on the label, but it can't guarantee that products are gluten-free because its suppliers may not provide gluten-free ingredients, the rep said. Therefore, Mondelēz International does not recommend its products for those on a strict gluten-free diet, she said. As you can see, there are more than a few choices of gluten-free gum, including sugar-free, teeth-whitening, and all-natural varieties. Just avoid the ones that aren't considered gluten-free.